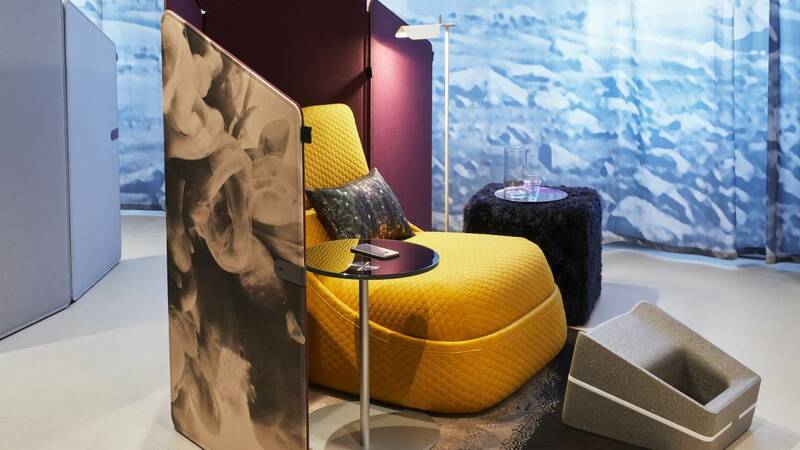 Steelcase unveils new showrooms, partnerships and product innovations at NeoCon. It’s a new day – the work we do has changed and so should our office. For the first time, Steelcase, Coalesse and Turnstone, along with an extensive new network of partners, come together in expanded and redesigned showrooms on the east wing of the third floor of the historic Chicago Merchandise Mart. The showrooms have already been recognized for Best of Competition and Best Large Showroom at NeoCon 2018. Two distinct areas complement one another within the new showrooms: the Steelcase WorkLife demonstrates how a ‘smart + connected’ workplace can improve the employee experience and drive innovation, and the all-new Steelcase WorkCafé features a dynamic ecosystem of spaces designed to support the wellbeing of people and foster connections at work. 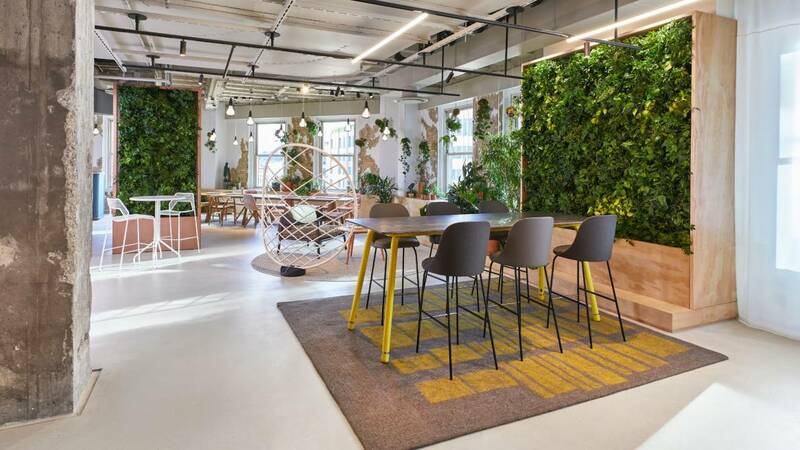 “High performing workplaces are feeling more like creative studios versus corporate offices,” said James Ludwig, vice president of Global Design and Engineering. “These showrooms are a reflection of the way work is changing today.” The WorkCafé was designed by Shimoda Design Group in collaboration with the Steelcase Design Studio, teaming up again to complete the vision begun with the WorkLife in 2008. Steelcase Health, Steelcase Education and Designtex complete the experience with all-new, expanded third floor showrooms. Steelcase is featuring solutions from its growing network of global partners that is quickly becoming one of the largest in the industry. Recently announced collaborations in the U.S. and Canada include West Elm, Extremis, UHURU and SnapCab. These brands complement an already extensive Steelcase portfolio and existing partnerships with great brands such as BluDot, FLOS and Mitchell Gold + Bob Williams, among others. Steelcase expects to offer a collection of west elm furniture with a distinct modern, residential sensibility throughout the U.S. and Canada by the end of the year. Additionally, the two companies plan to co-design, make and distribute new workplace solutions to meet the evolving needs of people at work. SnapCab joins the Steelcase network of partners, offering stand-alone offices that are quiet, easy to install and relocate, and can be customized to suit any work environment. SnapCab will be available in North America. Extremis, a renowned Belgian furniture design group offers a collection of products that focus on togetherness and celebrating life indoors and outdoors. The collection of Extremis products will be offered in North America with expected availability in late summer 2018. Based in Chicago, Sagegreenlife designs, manufactures and installs living green walls that can be scaled for any size project – rethinking the way people engage with nature. It’s alliance with Coalesse is designed to enliven the workplace with living walls. Mitchell Gold + Bob Williams mission is simple: to provide comfort for all at home and at their home away from home. The company’s Contract division is a premiere manufacturer of high-quality, comfortable hospitality and commercial furniture. FLOS is a global leader in lighting design founded in Italy. Collaborating with the world’s foremost designers, FLOS combines beauty and technology with a sense of play to create modern classics that do more than light a room. Blu Dot is a Minneapolis-based designer and maker of modern furnishings, spanning multiple home and office categories. The company was founded with the goal of bringing good design to as many people as possible by creating products that are useful, affordable and desirable. Based in Spain, Viccarbe offers contemporary furniture designed by prestigious international designers for the home and office. Coalesse exclusively represents the Viccarbe Imports Collection which is an award-winning portfolio distinguished by great simplicity, innovate elegance and global brand awareness. 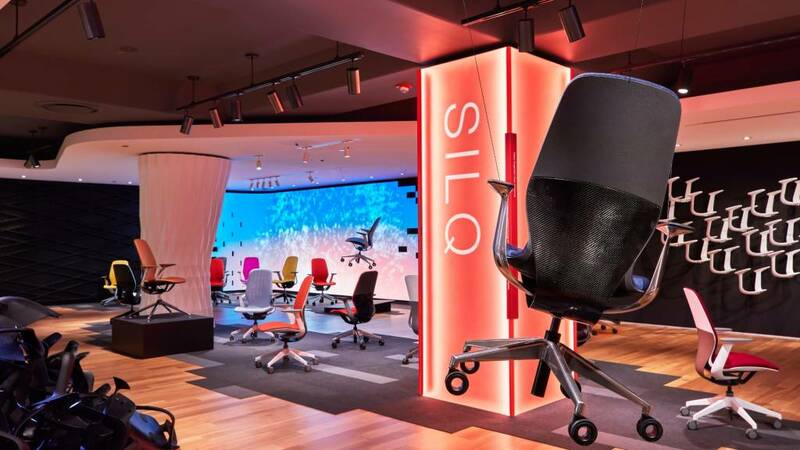 Steelcase recently announced an expansion of its relationship with Microsoft, furthering their shared belief that technology can make space more effective and that well-designed places can make technology easier to use. In collaboration with Microsoft, Steelcase is creating a system of easy-to-hang wall mounts and a lightweight rolling stand with the new Surface Hub 2 that give people true mobility to collaborate anywhere. Beautiful, versatile, and sustainable, Coalesse collaborates with ARZU STUDIO HOPE to offer rugs designed to make a difference. ARZU minimizes environmental impacts while maximizing fair labor practices in Afghanistan. Hans J. Wegner’s designs are renowned for their generous comfort, practical functionality, and organic sculptural beauty. The unique partnership between Coalesse and Carl Hansen & Son brings handcrafted, high quality Hans Wegner designs imported from Denmark to the workplace. The EMU Advanced Collection, from Coalesse, inspires fresh and inviting outdoor workspaces. Established in Italy in 1951, EMU is known for making exceptionally crafted modern furniture that is beautiful, durable and comfortable. Steelcase is also introducing a broad range of innovative solutions inspired by its in-depth research of people’s needs in the workplace. 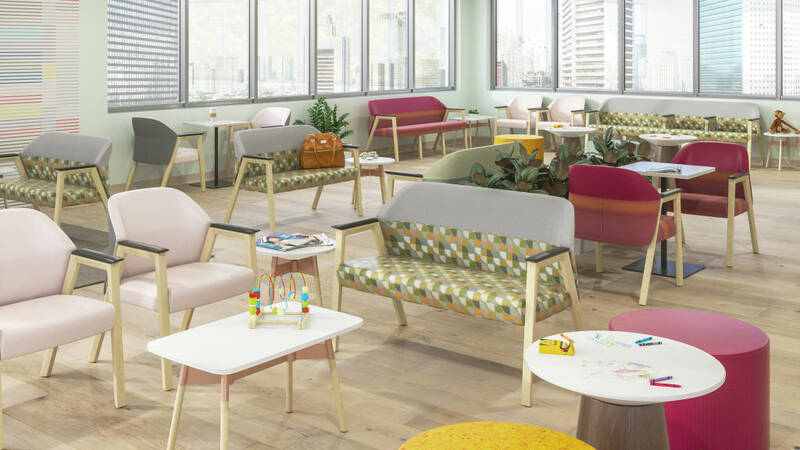 To help organizations create an inviting and comforting waiting or transition area, Steelcase Health introduced the Embold collection of seating and tables at NeoCon. Embold combines beauty with accessibility while offering a variety of sizes and material options for a wide range of people and spaces. A freestanding screen from Turnstone that provides on-demand privacy in open office environments. Clipper comes in either a 72-inch height version or a 56-inch version, covered in fabric with optional contrasting colors, a magnetic closing system and handles for easy portability and storage. A versatile, multi-use stacking chair by Wiesner Hager. A great solution for café, front porch, touchdown and guest spaces. Its comprehensive statement of line includes a four leg café, a four leg frame that links, a sled base chair, and café and bar height stools. Convey modular casework supports dynamic and ever-changing healthcare environments with an elevated level of choice, quality and design flexibility. A spectrum of modular components align along a continuous rail and micro-adjust for a perfect fit. Coalesse Pattern and Color programs enriche your design choices. Coalesse pattern includes a series of textural surface patterns drawn from nature – adapted from earth, sea, sky and water – which can be applied to LessThanFive or glass top tables through custom capabilities. Coalesse Color empowers designers to express their own color point of view through infinite color options on select products. Materiality has the power to bring a warm, inviting sensibility to work. Coalesse Material Capabilities allows you to add sensory richness to the workplace — by expanding your material choices through our custom capabilities. New solid materials including select hardwoods, stone and composites are now available on select Coalesse tables through our Specials process — to make personalization easy. Motif is a high-performance collaborative panel system that can be configured in countless ways to turn unused wall spaces into places where teams express and share ideas together. An array of sizes and colors allow for flexible compositions in a variety of locations. Motif panels are lightweight and easy to install. Ology with Active Touch with Active Touch, designed to promote user movement and wellbeing, includes two control options: Simple Touch, which empowers people to effortlessly move the desk up or down without taking their eyes off their work, and Active Touch, which reminds workers to change posture with gentle desk motions. It also pairs with the new Rise app (available Winter 2018). New Campfire Lounge Enhancements, 60- and 90-degree corner units, create new applications with big and half lounges. New waterfall edge and upholstery options expand the range of expression. Perfect for the home or office, conference room, dining room or coffee shop, Shortcut Wood from Turnstone brings a strong design aesthetic and the warmth of natural materials into the spotlight. In addition to new standard table shapes and tops, new components for Bassline include credenza storage and seating – with unique features to personalize. Mobile and flexible, Shortcut with Tripod Base and Personal Worksurface supports active learning in the classroom. engineered geometric design in the backrest offers flexibility—encouraging healthy movement and providing support for posture changes. With integrated LiveBack™ technology and a breathable, transparent aesthetic, Amia Air is ideal for busy people and growing organizations who excel at doing more with less. Brody Desk is a high-performing private workstation designed specifically for the in-between spaces in corporate and education environments. As dedicated spaces for resident workers in open-plan offices, touchdown spaces outside in-demand project rooms or study carrels in busy student commons areas — Brody Desk provides people with moments of focus in high-traffic settings. Sleek and slim,a3 CeramicSteel Sans is a frameless writing surface that appears as if it’s floating on the wall. With precision-cut, sealed edges and simple installation, it is a modern take on the traditional framed whiteboard. a3 CeramicSteel Flow is a framed, full-height writing system. With no vertical joint covers, this modular system is easy to install and configure. B-Free is a full range of modular furniture aimed to design multiple and easily reconfigurable settings. The B-Free High Table creates a focal point where people can connect, collaborate and concentrate. Creative Spaces, created by Microsoft and Steelcase, is an immersive ecosystem of spaces that brings together place and technology to help people generate new ideas and move them forward. Steelcase Surface Materials added seven new global accent colors to its extensive portfolio including lagoon and honey (shown here), peacock, saffron, aubergine, jungle and merlot. Answer Beam’s lower elevation complements an open plan and offers an updated feel. To meet the unique spatial needs we are seeing in today's workplace, Steelcase has added a freestanding enclosed solution, the IRYS pod. Enea Café Stools from Coalesse help create inviting and thoughtfully curated workspaces. The warm, modern design of the Enea Café Wood Stool makes a statement with a residential design character. Designed for quick sits, Campfire Pouf's clean lines, lightweight construction and elegant simplicity bring comfortable, durable seating to any space. 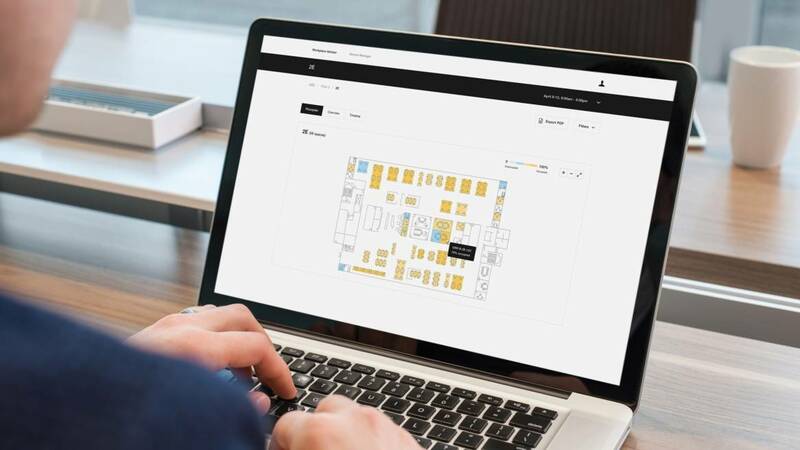 Workplace Advisor is a suite of workplace measurement and analysis tools that provides data and insights on space usage, revealing opportunities to optimize the workplace and improve the employee experience. Workplace Advisor is built on the Microsoft Azure platform. Live Map, also built on the Workplace Advisor Platform, lets people orient themselves to a space and immediately see what is in use and what is available. The Steelcase Find app allows employees to quickly find and easily reserve the best space to meet or work, on demand. The Steelcase Rise app pairs with Ology Active Touch height-adjustable desks to inspire movement and offer a new level of personalization. 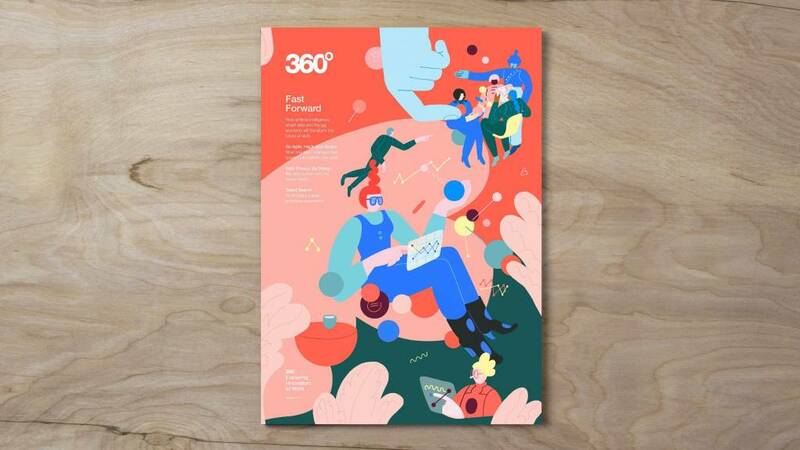 Fast Forward, the newest edition of 360 Magazine, launched at NeoCon. Inside the latest issue, we share what we’re learning about how artificial intelligence, smart data and the gig economy will transform the future of work. Also, explore how data privacy takes on new dimensions as the importance of data as a business resource soars. And, hear from Mitchell Gold + Bob Williams about their purpose “Comfort for All” that drives everything they do. The full magazine is online right now or listen to our 360 Real Time podcast all about this latest issue, Predicting the Future. 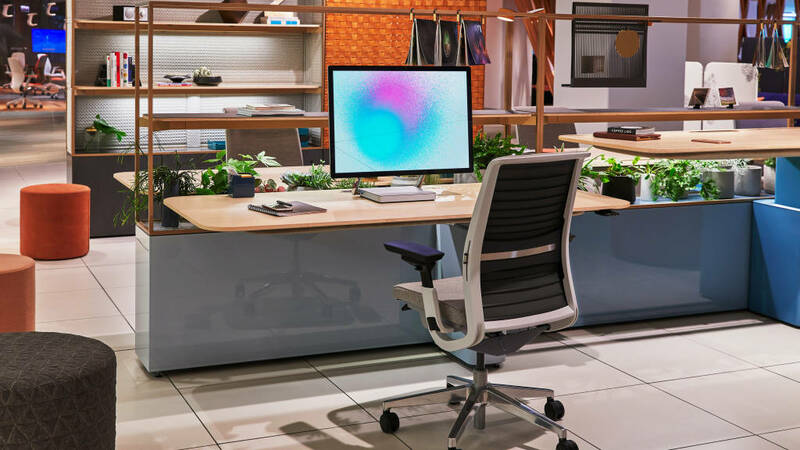 Steelcase invites you to the new Chicago WorkLife experience June 11-13, 2018 at NeoCon. If you won’t be in Chicago, you can follow along with exclusive Facebook Live interviews and live tours.